I think the project is very worthwhile; we who know and practice ‘tradition’ must keep it going, especially the teachers and coaches. Otherwise, it’s fast becoming a dying art. I would like to lend my support to Bel Canto Institute. It is very necessary to have such training available to young artists of the future. The Bel Canto Institute is an innovative, interesting approach to a much neglected area of performance. I owe so much of what I’ve done to you—–both your influence directly and indirectly have shaped my career to this point…so, from the bottom of my heart, thank you!!! Bel Canto Institute Summer Program changed my life! I met incredible musicians that have since become family to me. I am so thankful to have found my voice with this institute! It is by far the best memories I will ever cherish. 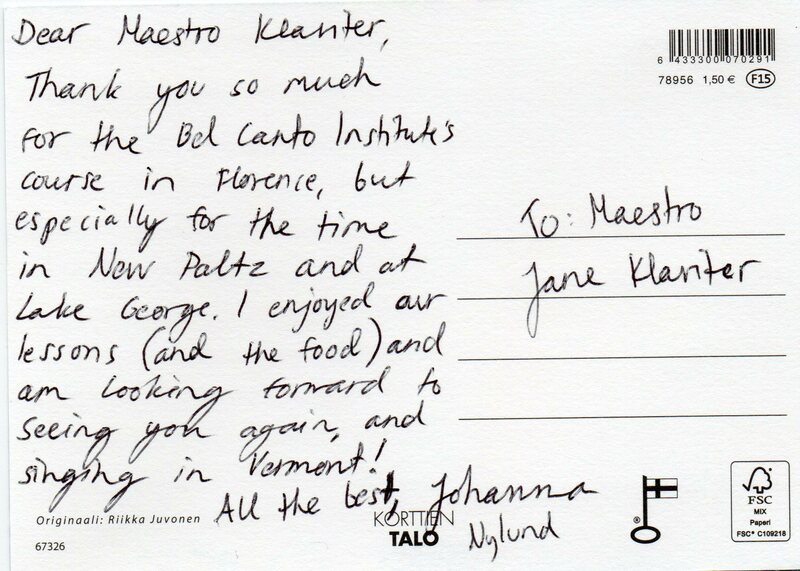 I had so many beautiful opportunities by being a part of Bel Canto Institute in Florence, Italy. I had such a wonderful experience at the Bel Canto Institute. I learned so much and grew tremendously. 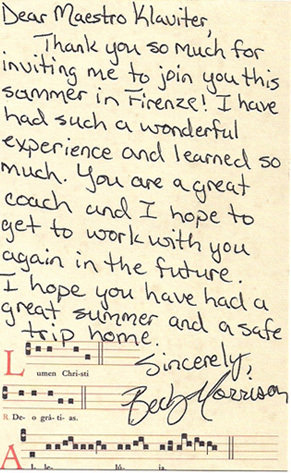 Between the excellent coachings and Italian instruction, you really do offer an amazing program. I truly came back a different singer. Participating in the Bel Canto Institute was a turning point in the way I think about myself as a singer and in the way I approach technique and learning roles. The small number of participants and the range of ages made a close-knit and supportive group. They were of the highest professional level…these people know what they are talking about! Master classes, dealing with performance practices, ornamentation, and expressive markings were a nice mix of singer participation and listening to recordings of the greats. The amount of individual attention from the coaches and language faculty is, I think, its biggest advantage. I can say with complete certainty that Bel Canto Institute has something to offer singers at every level. Bel Canto Institute is a truly nurturing experience for a growing singer. There was a wonderful sense of community among the singers. I greatly improved my language skills with Italian classes in the mornings. The combination of private coachings (with knowledgeable and accomplished coaches) and master classes was quite inspiring and enabled me to grasp a lot of information in a rather short amount of time. I learned a great deal in those three weeks about the bel canto era. 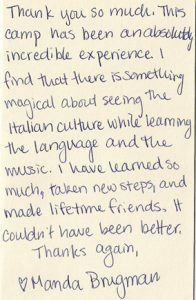 When I went to Italy the following summer, it was my experience at the Bel Canto Institute that had given me my basic survival skills. The daily coaching at Bel canto Institute was invaluable and is perhaps its biggest selling point. The quality was exceptional. I completed two whole roles which made me feel that my money was well spent. Everything in singing is lineage. Excellent singers have influences that read like the ‘begat’s’ in the Old Testament. Bel Canto Institute appealed to me as an opportunity to share in the lineage of the great Italian coach, Luigi Ricci, in whose memory the program is dedicated. 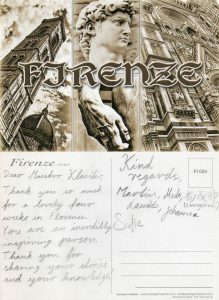 I studied with the great basso Giorgio Tozzi whose vocal heritage was the Italian school, and then with Tito Gobbi in Italy, who always spoke of Ricci! Lineage! You get it at the Bel Canto Institute. Each coach is a treasure of knowledge, experience, and lineage to the “real” art of singing. Individuals work at their own level, from college age students to professionals. For me it was a feast——coachings every day, language immersion, lectures. As with any program, you get what you bring to it. But this program is the best! Thank you for this unforgettable experience! I have grown so much as an artist and a musician because of this program. 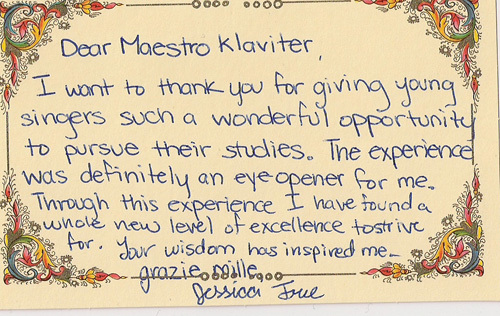 Thank you so much for adding an Orchestral Program to your already wonderful Institute. Your dedication to opera education for students has truly been a blessing for me—I have been rewarded hugely from this program. The knowledge of the professors here (and their willingness to assist in whatever way possible with our learning) has been an incredible experience for me and I cannot wait to put everything I’ve learned into practice. I would like to thank you for this wonderful experience! It has been better than I could have possibly imagined. I have learned so much, and I feel I am really starting to get a grasp in the Italian Bel Canto style. 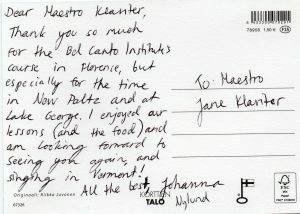 I wanted to write you to thank you so profusely for a wonderful experience at the Bel Canto Institute(or, “Opera Camp”, haha!). I was having a lot of vocal trouble earlier this summer, and I feel so much better and on track vocally. 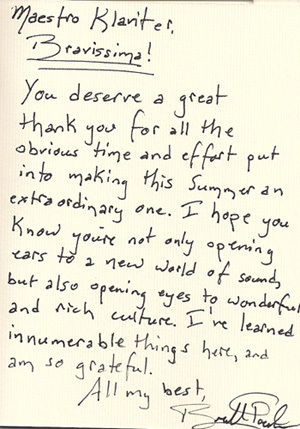 I feel especially grateful to have worked with you. It is a true privilege to work with a master. I have often struggled with implementing the things that coaches or other musicians, but I did not have this problem working with you. I learned about style, tradition, and the importance of really knowing every single detail about your music. But I also benefited technically from working with you, and never felt pushed in an unhealthy direction. 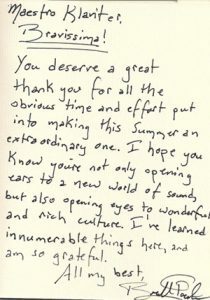 I really appreciated your commitment to each of us individually and your holding us to a high standard while also being incredibly intuitive about where each of us are in our journeys and how much we are capable of. 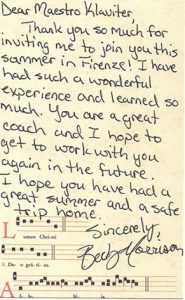 I went in to the program knowing almost nothing about Bel Canto style, and feel that I have left Florence with an incredible wealth of tools and knowledge. I look at the music in a completely different way, and can understand it so much better. I also learned so much about performance and professionalism. I grew so much in just one month working with you and the other Maestri. I will be recommending it to every single singer I know. It is so important. Thank you again. I feel so fulfilled! 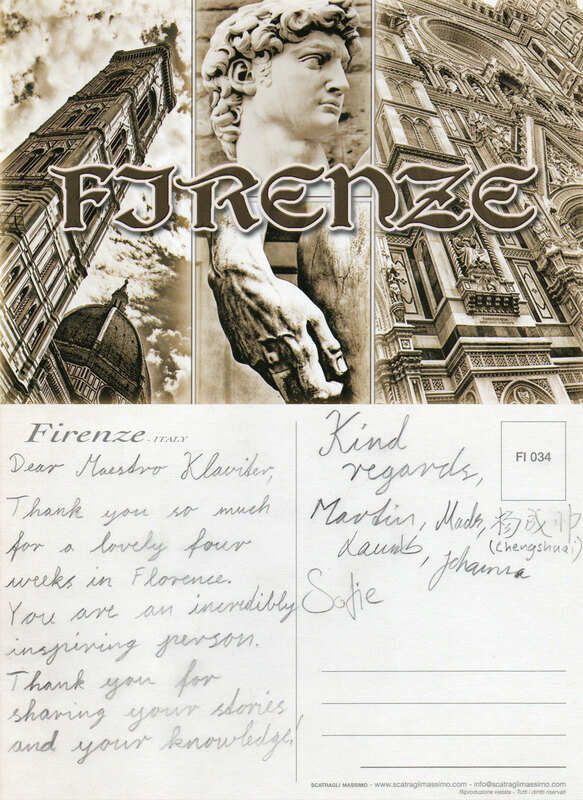 I came to Florence thinking that I shouldn’t expect to be as satisfied with Bel Canto as I was with my French program, simply because my time in France was extremely fulfilling and uplifting both socially and musically. 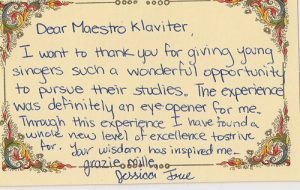 However, your program highly exceeded my expectations: it was exceptional in the close attention to detail of its instructors, and in the expert knowledge of bel canto singing imparted to its participants. Your “Opera Camp” satisfied my fierce appetite for the authentic rigor that committed musicians find vital to their craft, and it pushed me out of my comfort zone in the most productive way. I absolutely loved coming to your coachings; ever unsure that I could deliver results that would please you, always certain that I would come away with invaluable critiques. 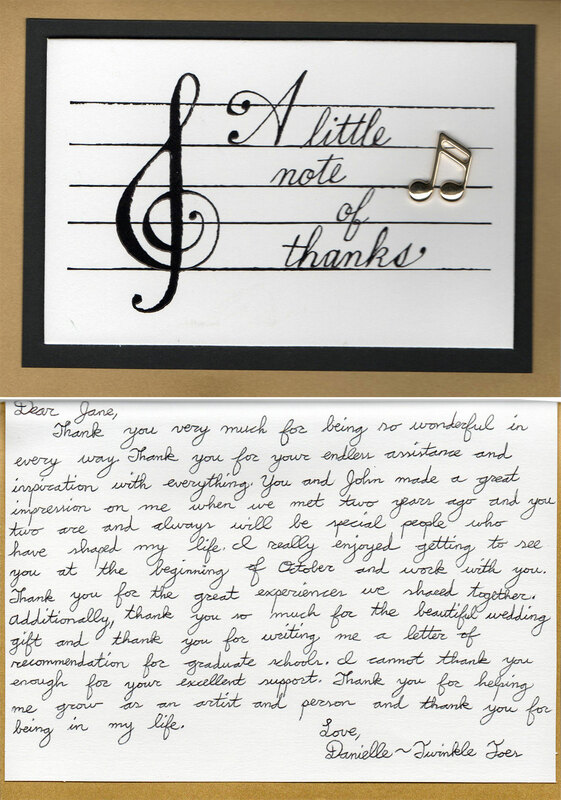 I am inspired by the generosity with which you shared your expertise with your students.Your commitment to bringing out the best in every singer you work with is truly inspiring and heartwarming. 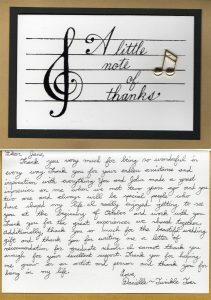 Thank you for making the magic of bel canto accessible to those who might not otherwise receive such individualized instruction. At the beginning of the program, I had very limited knowledge and understanding of bel canto opera and art song, but I left with such a great appreciation for both the process of creating the music and the satisfaction of a well curated performance. I now look at music in a completely different way (even more nitpicky than before, which is astonishing to me), with so many more tools to tackle each composition and a much better idea of what I want to create – largely thanks to your amazing demonstrations! You often reiterated to us that you thought you could not phonate, but you sing with more legato, expression, and poise than most of the singers I know. This was one of the most formative experiences of my life.I have already told many of my singing friends about this program, and I will continue to recommend it to every singer I know. Thank you for everything. Bel Canto Institute Summer Program was life changing for me. It encouraged me to look for better opportunities and it broadened my vision. I had never before experienced the intensity and joy of working like a professional. Being immersed in a dynamic like that gives you the tools and changes your attitude for your work-life. I will never forget the time I spent at Bel Canto Institute. It’s one of the best summer programs I have ever attended. I learned so much there. Thank you so much for giving me the opportunity to have that once in a lifetime experience! I would like to thank you for all of the lessons and time you spent with me this summer. 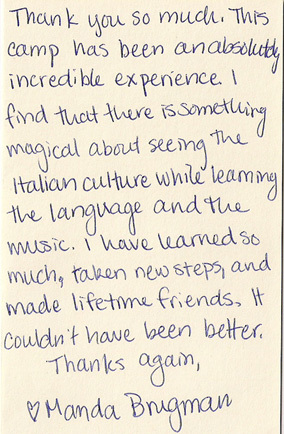 It has truly made me a better performer, singer and Italian speaker. Thank you so much for this experience.